Expand your customer reach using Xavor's Orchard CMS offering. 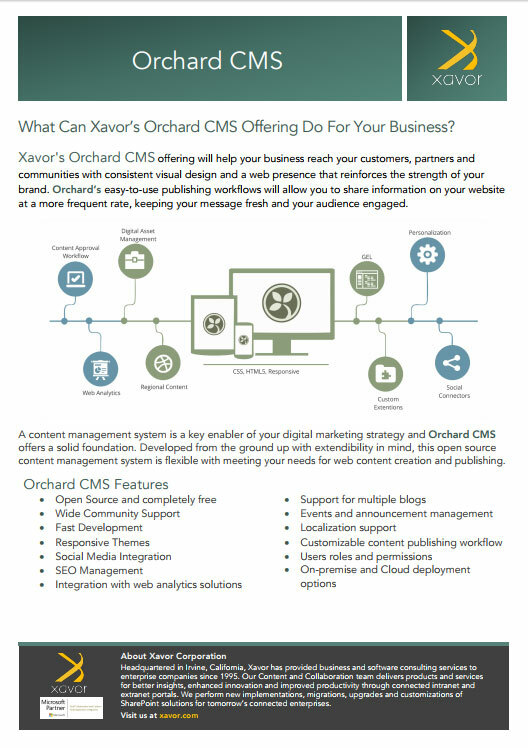 What can Xavor’s Orchard CMS Offering Do For Your Business? Xavor’s Orchard CMS offering will help your business reach your customers, partners and communities with consistent visual design and web presence that reinforces the strength of your brand. Orchard’s easy to use publishing workflows enable you to share information on your website more frequently, keeping your message fresh and your audience engaged. A CMS is a key enabler of your digital marketing strategy and Orchard CMS offers a solid foundation. Developed from the ground up with extendibility in mind, this open source content management system is flexible with meeting your needs for web content creation and publishing. Xavor’s Orchard CMS team has a deep understanding of the underlying architecture of Orchard CMS to customize and extend the platform to meet your unique needs.